A young girl who witnessed the tragic crush which killed three teenagers at a St Patrick’s Day event in Tyrone has described how people struggled to get their friends off the ground as the pushing worsened. 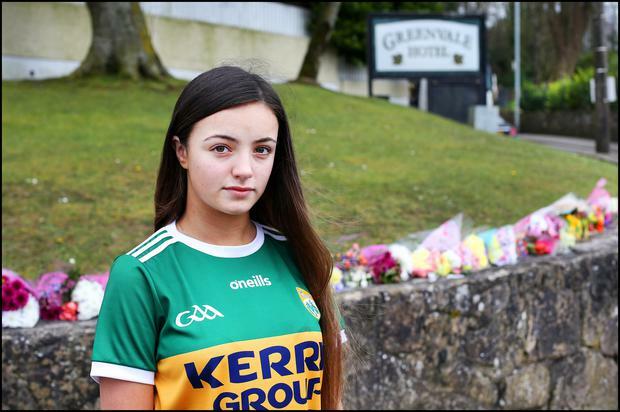 Eboney Johnson (16) was one of up to 400 people at the Greenvale Hotel in Cookstown on Sunday night which left three dead and several injured. The teenager said she was at the front of the queue to get into the hotel when the pushing started. It escalated and she saw several people lying on the ground, including Conor Currie (16) who died during the crush. Lauren Bullock (17) and Morgan Barnard (17) also tragically passed away following the incident. Speaking to Independent.ie from outside the Greenvale Hotel this afternoon where she had brought flowers for the deceased, Eboney Johnson said: "We were all up in the queue at the front. The pushing and everything had started but that would be normal enough on a night out. "The bouncers would normally come out and get us in some sort of a line but I think they never realised the seriousness of it at that stage. We were lucky we were in a corner but some people started to go down. "People were trying to pick each other up. Every time someone went down to pick someone up another person would push. As people tried to pick people up it just became a struggle. I’d have to say for all the lads that were there they done most of the work lifting everybody up. "It was like a (protective) circle was formed pushing everyone out but nobody realised why,” she said. Eboney then described seeing several people on the ground, saying the situation could have been helped. "I looked down and could see everybody lying there, and I could see Conor himself there getting the help that he needed. It was such a tragic situation. I wouldn’t know if it could have been prevented but it definitely could have been helped. "That’s all we would have seen then there were people taking us younger ones away from the scene so we wouldn’t be able to see it. Her mother Wendy said she was one of the lucky ones who managed to bring her child home. Wendy Johnson told Independent.ie: “It’s horrendous, you were just waiting to see if your own child was okay and as I say we were the lucky ones who got our children home, but it’s just an awful tragic event even for the young children to watch and to witness their friends going through what they went through. The PSNI’s serious crime branch are investigating the planning and organising of a St Patrick’s Day event in a Tyrone hotel where three teenagers died during a crush. Lauren Bullock (17), Connor Currie (16) and Morgan Barnard (17) from Dungannon in Co Tyrone, died in the tragedy at the Greenvale Hotel in Cookstown on Sunday night. A number of people were also injured in the crush which investigators say went on for a number of minutes. To date the PSNI has identified 160 people who were present, and have spoken to several of them, but believe as many as 400 people were either inside the hotel or in the car park on the night of the tragedy. Katherine Donnelly TEACHER leaders claim an end is in sight to their long-running battle over pay inequality after a breakthrough deal with the Government. Laura Lynott Bridget Ward (11) who tragically died on Easter Sunday while cycling with her little brother Patrick, has been described as “an angel”.